In case you don't already know, the first Dayton Man B Que was held here at Chez Food vs Face last weekend. I'll have some upcoming links to the MBQ site with all of the amazing recipes soon. For now, though, you'll have to get by on the leftovers. The festivities left behind all sorts of food in it's wake, from already cooked food from the night before, to about 2 1/2 pounds of ground chuck and various cheeses. My sister's mister missed the event because they were to busy gettin' their metal on with Iron Maiden in Cleveland, so I decided to throw some of my own burgers together and invite them over. 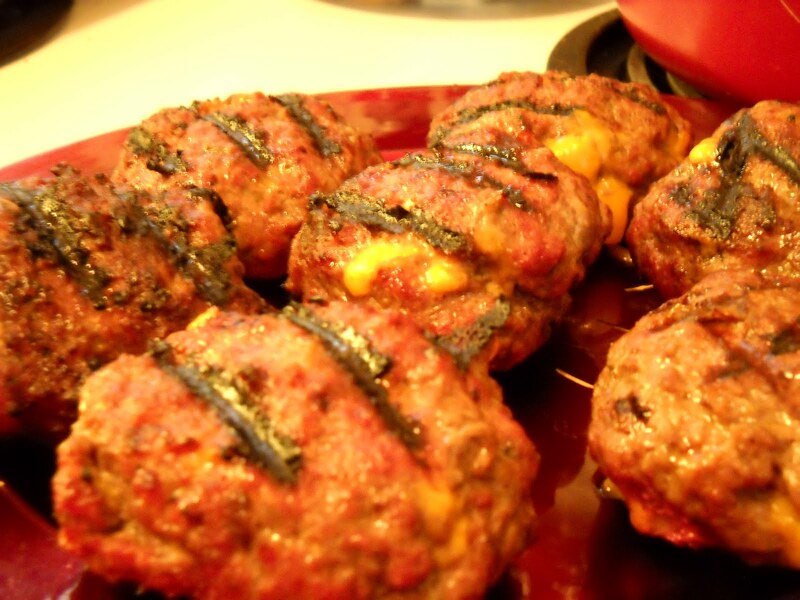 Combine all of the ingredients with your hands until very well mixed and form into patties. My personal preferred method is to make them into giant meatballs and flatten them just slightly - that way they don't cook too quickly or overcook. If you spy any of the cheese cubes poking out, thumb them back in and cover it up with ground beef. This will keep the precious cheese from oozing out during cooking when it starts to melt. Toss them onto a 400 degree grill for about 3-5 minutes per side, or until they've got just a little give left to them, much like a medium steak (should create the same resistance as touching your nose with your finger). DO NOT squish the burgers with the spatula and let all of that fabulous juice out. You're grilling, so most of the actual fat will drip off. If you press them, you're ridding the burger of it's natural juices, i.e., flavor. If you're feeling fancy (which we always are), top it with some onion rings or French fried onions, and enjoy the sound of your arteries clogging and life becoming exponentially more wonderful with each bite.